I've already told you all how much we loved Topsail Island. We had such a great time, and we're sorry to have our vacation behind us. But. We have wonderful memories, and lots of terrific pictures. Lots and lots of pictures. My Favorite Picture - Kinda says it all, doesn't it? Harley says "Welcome to Topsail!" We had some gorgeous, sunny days . . .
and we had some rainy days, which were still pretty gorgeous . . .
We had great beach walking days . . .
and some evenings to watch some pretty spectacular sunsets. 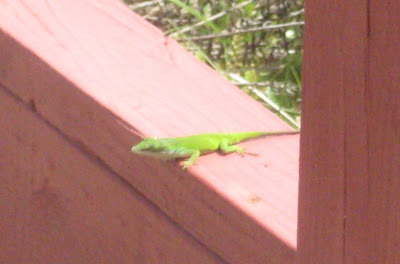 And when it was time to leave, our little deck buddy popped out to say goodbye. And then. On the way home, we pulled off the expressway for a little rest stop and saw this - just what we needed to make us chuckle and get over those "time to leave the beach blues." Sadly - there's a postscript I'd like for you all to know about. Skip ahead a year to May, 2010. We were scheduled to come back to Topsail, but my Donald suffered a heart attack. He's now doing well, thank you, but we, of course, had to cancel our trip. The morning we were to leave for Topsail, Donald was airlifted by helicopter from Boone to Asheville Mission Memorial Hospital and was there for five days. I love your photos - thanks for sharing. Makes me want to find a beach somewhere and just sit on it! Your photos are just gorgeous. Oh, how I envy you! If your house had been any closer to the beach it would have been in the water. Your kitchen looks like mine, only yours is prettier -- nicer colors. Well, Harley looks like he's in beach heaven in your opening photo. (-: And your last photo is so cute -- you ought to enter it in a contest somewhere. Wonderful pictures Kaye! I think what I need is a week at the beach! I sing the praises of beaches loudly. They restoreth the soul. (and make little dogs filthy and happy). Pat - funny you should say that about the house being almost in the water. the last day we were there, Donald was chatting with someone he had met who lives there. There was a bad storm last year which wiped out about 150 homes, and left many sitting right at the ocean's edge. A federal grant was given to Topsail to pay for trucking in MANY loads of sand to restore the beach. I remain puzzled as to why someone would build, or buy, a house that close to the water. They obviously have way more money than Donald and I. Beautiful, Kaye. Wish I'd been there, but it looks like you & your loves had plenty of fun without me! Wonderful pictures, Kaye -- waves and skies and sunsets, oh my! Oh my God, these photos are staggering. I must go there. Today. Plus you are goddesses of the highest order. Boy! Harley sure looks like he loved the water. That would be my babies, too. So glad he could enjoy the beach with you both! Glad it was a wonderful time for you, Kaye. Hi, Kaye Darlin'. Carol and I watched a movie yesterday with scenes in Delaware and that reminded her of Maryland, which reminded her of Ocean City and all the times we went there and she said, "I miss those days." I said I missed them, too. Well, this morning, I scrolled through your pix of the beach at Topsail and missed those days even more. I won't get over it till the day comes when the four of us meet in OC and walk the surf, then plop in the sand and laugh out tails off.